Safely and comfortably fade the appearance of rosacea, skin imperfections caused by sun damage, age spots, and uneven skin tones created by brown and red spots. 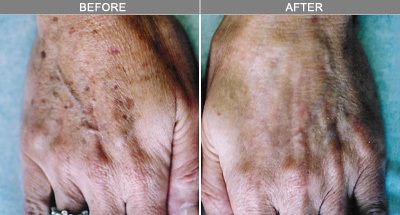 Age spots are flat brown-black spots that usually occur in sun-exposed areas on the body. Age spots are sometimes called brown spots or liver spots. They are completely unrelated to the liver or liver function. Liver spots are associated with aging. The increased pigmentation is brought on by aging, exposure to sun or to other forms of ultraviolet lights. The combined Bi-polar Radio Frequency and Light energies of elōs technology precisely and safely targets pigmented lesions such as freckles, sunspots and age spots. 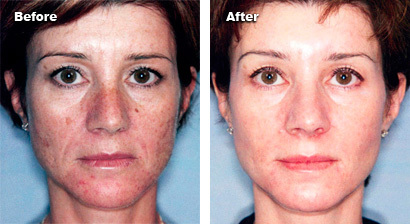 Gradual and cumulative improvement of skin tone is typically achieved between 5-6 treatments. The total number of required treatments depends on your skin’s condition. Schedule a free consultation to establish your personalized treatment schedule. George J. Hruza, M.D., Amy Forman Taub, M.D., et al. Electro-optical synergy (elōs) technology for nonablative skin rejuvenation: a preliminary prospective study. Hammes S, M.D., Greve B, M.D., Raulin C, M.D.